Industrial screwdrivers. 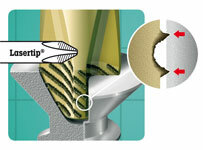 Kraftform® Plus cersions feature unique anti-slip Lasertip® tips. Ideal for most jobs. Long life (Kraftform® Comfort drivers feature Wera BlackPoint).